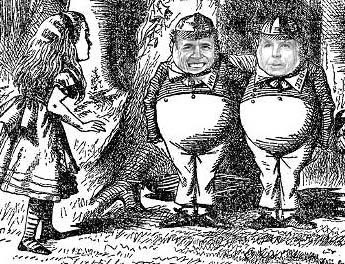 The Dividist Papers: Through the looking glass with Obama, McCain, the Constitution, and FISA. Through the looking glass with Obama, McCain, the Constitution, and FISA. As a self described "libertarian-leaning" independent, I have struggled to find satisfaction in the voting booth. I would like to vote for candidates that are not only consistent with my beliefs [To whit: Federal government should be limited in scope, provide for common defense, protect and respect individual rights, spend and tax in a fiscally responsible manner, provide effective oversight of elected and appointed representatives, legislate carefully and slowly, and pass only laws that are tempered in the fire of partisan debate], but also offer hope of having a practical real-world policy impact on the operation of our federal government. This latter criteria excludes voting for a third party like the Libertarians, which, while generally consistent with my views, are impotent in implementing actual policy and therefore IMHO a wasted vote. The closest I have come to a satisfactory voting strategy was outlined in my post "Voting By Objective". 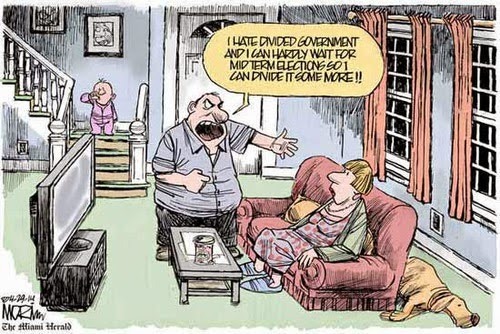 The objectives listed above have historically been most closely addressed by voting for divided government. Problem being, this voting strategy requires holding your nose and frequently casting a vote for candidates with the stench of statist policies that are hostile to constitutional freedoms. Case in point, the 2008 presumptive nominees for President. "McCain, co-author of the McCain-Feingold law that abridges the right of free political speech, has referred disparagingly to, as he puts it, "quote 'First Amendment rights.' " Now he dismissively speaks of "so-called, quote 'habeas corpus suits.' " He who wants to reassure constitutionalist conservatives that he understands the importance of limited government should be reminded why the habeas right has long been known as "the great writ of liberty." No state power is more fearsome than the power to imprison. Hence the habeas right has been at the heart of the centuries-long struggle to constrain governments, a struggle in which the greatest event was the writing of America's Constitution, which limits Congress's power to revoke habeas corpus to periods of rebellion or invasion. Is it, as McCain suggests, indefensible to conclude that Congress exceeded its authority when, with the Military Commissions Act (2006), it withdrew any federal court jurisdiction over the detainees' habeas claims? As the conservative and libertarian Cato Institute argued in its amicus brief in support of the petitioning detainees, habeas, in the context of U.S. constitutional law, "is a separation of powers principle" involving the judicial and executive branches. The latter cannot be the only judge of its own judgment. n Marbury v. Madison (1803), which launched and validated judicial supervision of America's democratic government, Chief Justice John Marshall asked: "To what purpose are powers limited, and to what purpose is that limitation committed to writing, if these limits may, at any time, be passed by those intended to be restrained?" Those are pertinent questions for McCain, who aspires to take the presidential oath to defend the Constitution. "It is absolutely false that the only unconstitutional and destructive provision of this "compromise" bill is the telecom amnesty part. It's true that most people working to defeat the Cheney/Rockefeller bill viewed opposition to telecom amnesty as the most politically potent way to defeat the bill, but the bill's expansion of warrantless eavesdropping powers vested in the President, and its evisceration of safeguards against abuses of those powers, is at least as long-lasting and destructive as the telecom amnesty provisions. The bill legalizes many of the warrantless eavesdropping activities George Bush secretly and illegally ordered in 2001. Those warrantless eavesdropping powers violate core Fourth Amendment protections. And Barack Obama now supports all of it, and will vote it into law. Those are just facts." Source: USA TODAY/Gallup Poll of 1,625 adults June 15-19. Margin of error: +/- 3 percentage points. Out of eight categories listed in the poll, Terrorism is the only one where the electorate thinks McCain would do a better job (within poll margin of error). In that category McCain leads by a very large margin. As a consequence we see McCain doubling down on his only strength, and Obama working to shore up his only weakness. The resulting "Alice in Wonderland" spectacle - Our two Presidential candidates are competing on the basis of who is willing to erode more constitutional protections and strip more of our rights in the name of protecting us from terrorism. Pick your poison. "Barack Obama plans to be the next President of the United States. Once he becomes President, he will be in the same position as George W. Bush: he wants all the power he needs to protect the country... Perhaps it gives a bit too much power to the executive. But he plans to be the executive, and he can institute internal checks within the Executive Branch that can keep it from violating civil liberties as he understands them. And not to put too fine a point on it, once he becomes president, he will likely see civil liberties issues from a different perspective anyway." So, between the sitting President and the two candidates to replace him, all believe in expanding the power of the executive branch, even to the point of overruling the protections of the Bill of Rights as they see fit. All three - Bush, McCain, Obama. Actions speak louder than words and when the rubber meets the road on real votes on real bills like the compromise FISA abomination, there is no qualitative difference on their views of the unitary executive, regardless of what they say to their gullible supporters. "Given the grave threats that we face, our national security agencies must have the capability to gather intelligence and track down terrorists before they strike, while respecting the rule of law and the privacy and civil liberties of the American people." He then goes on to explain why he is supporting a bill that does not respect the rule of law, nor the privacy and civil liberties of the American people. Let us be clear - Obama is explicitly and consciously playing the terrorism "Fear Card" to justify this decision. It is the exact same formulation he has campaigned against in the Bush administration, and the very thing that he decried as the "old politics of fear" when criticizing the Clinton "Its 3 AM" ad. "...no good comes from lending uncritical support to a political leader, or cheering them on when they do bad and destructive things, or using twisted rationalizations to justify their full-scale assault on your core political values. The overriding lesson of the last seven years is that political figures, more than they need anything else, need checks and limits. That is just as important to keep in mind -- probably more so -- when you love or revere a political leader as it is when you detest one... What Barack Obama did here was wrong and destructive. He's supporting a bill that is a full-scale assault on our Constitution and an endorsement of the premise that our laws can be broken by the political and corporate elite whenever the scary specter of The Terrorists can be invoked to justify it... In 1799, Thomas Jefferson echoed that: "Free government is founded in jealousy, not confidence . . . . Let no more be heard of confidence in men, but bind him down from mischief by the chains of the Constitutions." Between (a) relying on the limitations imposed by the Constitution or (b) placing faith in the promises of a political leader not to abuse his unchecked power, it isn't really a difficult choice -- at least it ought not to be, no matter who the political leader in question happens to be." One of the most seductive arguments against voting to maintain divided government is framed like this:"We need a single party Democratic government for a while, just to restore balance and undo the damage that has been created by the eight years of George W. Bush and six years of single party Republican rule." That illusion has now been shattered. Instead of undoing the damage, we are seeing the Democratic Party leadership of Nancy Pelosi, Steny Hoyer, Harry Reid and the Democratic presumptive nominee Barack Obama lead a Democratic Senate and Democratic House of Representatives to make the problem worse, by dramatically expanding the power of the Presidency at the expense of the Constitution and Bill of Rights. 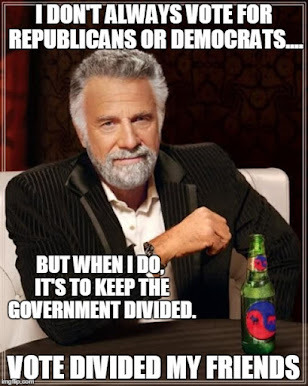 That is the meaning of the compromise FISA bill. Voting for an all Democratic Government in 2009 with expanded majorities and a potential filibuster-proof Senate is not the answer. It will certainly create more problems than it solves. For more, Damozel at Buck Naked Politics has a good compilation of blogger reaction to the Obama flip-flop, while Ed Morrissey at HotAir outlines Obama's history on the issue. "... the Blue America PAC is targeting Blue Dog Democrats like Steny Hoyer for their continued roles as complicit enablers of Bush's sham FISA bill. However, it should be noted that a more encompassing movement effort has recently sprung up, forged by both progressive and libertarians that will be using the Blue America PAC as a Phase I of of a multi-Phase strategy. It's being dubbed the Strange Bedfellows alliance. The headliners in this alliance are the ACLU, Glenn Greenwald, The Ron Paul Money Bomb team over at Break the Matrix, Jane Hamsher of Firedoglake, Matt Stoller of Open Left, and Ari Melber of The Nation." FWIW, the alliance now also includes mw at Divided We Stand United We Fall. If you are not looking to make a contribution, but still want to help fight the FISA compromise that will come to Senate floor this week, McJoan at DailyKos is tracking the progress of the bill and key Senators to contact. Although the fix is in, and it is likely that this pig will pass (after some Kabuki theater by Harry Reid and Barack Obama to provide themselves political cover) it is important to keep a very bright spotlight on the players in this show. I though you wouldn't join a club that would have you as a member. Let's not leap to any hasty conclusions. I have high hopes that they will kick me out within a few weeks. I don't know about that. They let Matt Stoller in so they've set the bar pretty darn low.